As soon as the first bottles of local cider appear in our markets, I put one in my cart, not just for sipping, but for cooking as well. I love to cook seasonally, and nothing says fall more clearly than fresh cider. 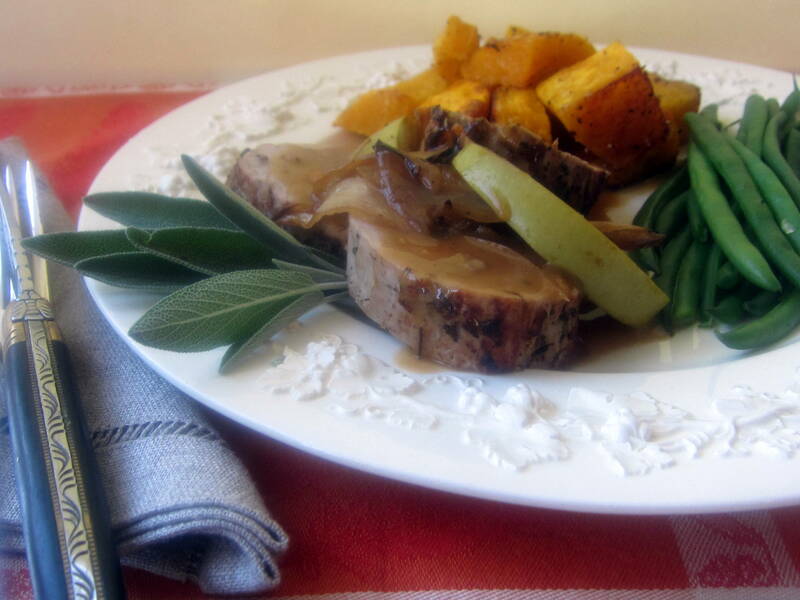 This year, along with serving mugs of warm spiced cider, I’ve used this fall libation to baste pork tenderloins seasoned with sage, thyme, and rosemary. After browning the tenderloins with some sliced shallots, I add cider to the pan, slide it into the oven, and then halfway through the roasting arrange apple wedges around the pork. As a finishing touch I prepare a quick pan sauce with more cider, a hint of cider vinegar, and some butter. I love the sweet and tart taste of the cider sauce that naps this fork-tender pork, and often serve it with sides of roasted butternut squash and tender green beans or with roasted Brussels sprouts and creamy polenta. Since this recipe takes only 30 to 40 minutes from start to finish it would work well for a family meal on weeknights, but it’s definitely special enough to serve for company too! 1. Arrange a rack at center position and preheat the oven to 400 degrees F. Have ready a medium large flameproof roasting pan or ovenproof skillet. 2. Pat the tenderloins dry with paper towels, and then tuck the tail end of each under and tie with some string. In a small bowl, mix together the sage, salt, thyme, rosemary, and pepper. Season the pork tenderloins on all sides with this mixture. 3. Place the roasting pan over high heat and add canola oil. When oil is very hot and shimmering, add the pork and brown on all sides for 5 to 6 minutes. After the first two minutes, add the shallots to the pan and stir and brown lightly along with the meat. Pour 1 cup of cider over the pork and shallots. 4. Roast the meat and shallots for 10 minutes. Then arrange the apple wedges around the pork (over the shallots). Pour 1/3 cup of the remaining cider over the meat and apples. Roast until apples are tender and meat registers 150 degrees on an instant read thermometer, about 10 minutes more. 5. Remove the pork, apples, and shallots from the pan to a platter and cover loosely with foil. Place the pan over medium high heat and add the remaining cider and the cider vinegar. Whisk the mixture constantly to scrape up any loose particles in the pan for 1 minute. Whisk in the butter, a little at a time. When all the butter has been added, whisk in the cornstarch mixture, and continue to whisk until mixture thickens and coats the back of a spoon. (If sauce becomes too thick, thin with a little extra cider.) Taste the sauce and season with salt and also with more vinegar if you want a sharper taste. 6. Slice the pork into 1/2 inch thick slices and arrange, slightly overlapping, on a platter surrounded by the apples and shallots, Nap the pork with the sauce and serve any remaining sauce in a small bowl. Serves 5 to 6. This entry was posted in Food News and tagged apples, cider, fall, pork tenderloins by brosbottom. Bookmark the permalink. I made this last night for dinner for ourselves and some friends and it was met with many, many compliments! Even my picky 13 year old daughter ate it. It was definitely easy and quick. Thank you for another great recipe, Betty! Thanks so much for your note! So glad to hear that your friends and your picky teenager liked it!